Invisalign gradually moves your teeth through a series of custom-made, removable, nearly invisible Aligners. You can brush and floss normally, which can help prevent tooth decay and gum disease. There’s no metal to irritate your mouth. 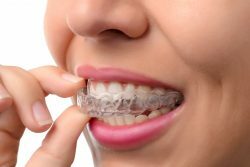 Some orthodontic appliances, like braces, can cause temporary gum inflammation (usually reversible once the braces are removed.) With Invisalign there’s decreased risk of lost braces, broken wires, or allergies to metal. Properly positioned teeth are easier to brush and floss than teeth that are crowded, crooked, or spaced too far apart. Properly aligned teeth can help gums “fit” tighter around them, which may lead to better periodontal health. With maintenance of good oral hygiene, the chances of having plaque retention, tooth decay, and periodontal (gum) disease can be reduced. In some instances, speech problems may result from poorly positioned teeth and jaws. Straightening your teeth with Invisalign will make you feel less self-conscious and more confident. Invisalign has proven to be effective in both clinical research and in practices nationwide. Over 100,000 people are already smiling more thanks to Invisalign. Ask you dentist about Invisalign and Start Smiling More!